If Pride and Prejudice had a fault, it would be that we never really know anything about Darcy’s parents or his childhood. Perhaps, he simply got taller, older–a more adult version of his child-adult self. Yes, we know about Wickholm and his sister, but he never allows us, the dear readers, a moment into his emotional state as a child. We simply take his word for his childhood. As a reader, I often wondered if there were a twinge of jealousy because Wickholm could charm everyone, and Darcy couldn’t. Isn’t anyone else curious if Darcy cried when his mother past into the afterlife? Or if he sulked away from his father when Wickholm became the favorite? I do. And that’s the glimpse we get in Barbara Tiller Cole’s book: Fitzwilliam Ebenezer Darcy. Essentially, a lovely mash-up of Pride and Prejudice(behind the scenes) and A Christmas Carol. What I enjoyed particularly about this Austen mash-up was the glimpse behind Darcy’s emotional wall and how his father taught him to put up such walls. While I would refrain from blaming all of Darcy’s emotional problems on his dear old Dad, I do think Darcy would’ve been more like the other Austen men(a.k.a. idiots who can’t see their loves right in front of them…oh, that might be men in general). So when Darcy’s father comes back as a ghost, he begs forgiveness for indirectly having caused his son pain. Insert: maudlin displays of emotion and reconcilliation here. Perhaps, we do understand where Darcy’s emotional hollowness comes from, and we also see how important forgiveness is. Sins of the past may haunt beyond the grave, but at least, Darcy’s father did have the opportunity to make things right with his son. Also, how nice of this to be around the holidays when we are all thinking warmer, happier, more loving thoughts? And isn’t that what the Christmas season is all about? 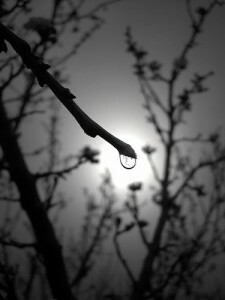 *Photo: Tear Of a Tree by ˙·▪•● Peyman ●•▪·˙, obtained through Flickr Creative Commons.